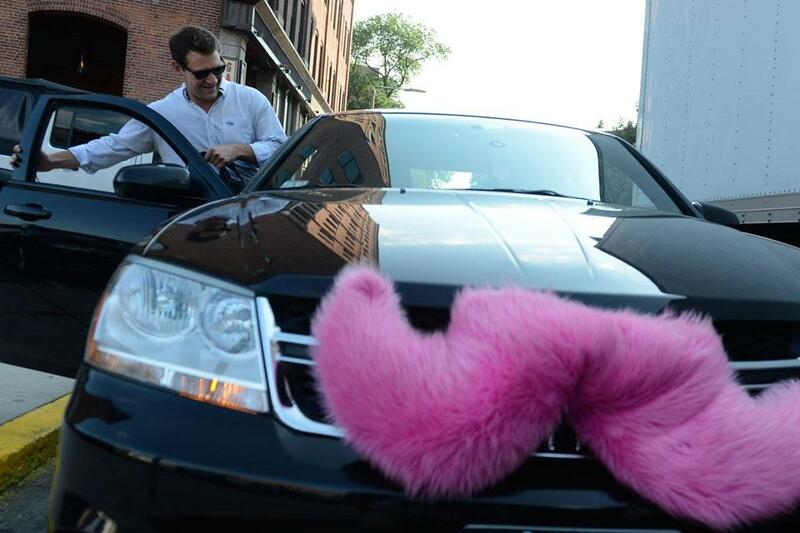 Hunter Perry gets picked up near his office on Harrison Avenue by Lyft, whose vehicles sport a pink mustache. Compared with the shopworn insides of so many city cabs, Bria Schecker’s for-hire car is an urban oasis. Her 2010 Honda CR-V is showroom-clean, and her enthusiasm would put a Walmart greeter to shame. When one passenger, Hunter Perry, climbed into the front seat on a recent muggy night, he got a fist bump from Schecker, a chilled Nantucket Nectars fruit drink, and his choice of music from a windshield-mounted iPhone 5. By the end of the ride they were exchanging e-mails and later found each other on LinkedIn. For her passengers, “It’s like hopping in a car with your friends,” said the 26-year-old Schecker. 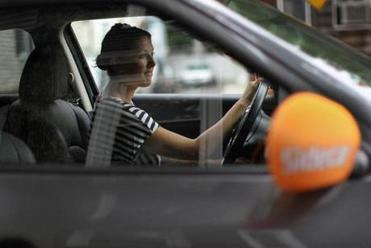 She is among a new breed of drivers who provide taxi-like service, using their private vehicles, through so-called ride-sharing services such as Lyft and Sidecar. Passengers use a smartphone to hail a ride, and Lyft or Sidecar pings drivers for the pick-up. Sidecar and Lyft share many similarities. Here is how the services work. Unlike in a cab, there is no meter; the driver uses the GPS in a smartphone to calculate the fare, and passengers are billed electronically. Another difference: Instead of a taxi logo, the cars are marked a bit more creatively — especially the Lyft cars, which sport a large neon pink mustache on the grille. Ride-sharing is one of the business models springing out of the smartphone revolution that seem to have been made for, and by, the young, tech-savvy set who use the Web for everything from marketing their businesses to watching TV — and see a real taxi as belonging to an older generation. 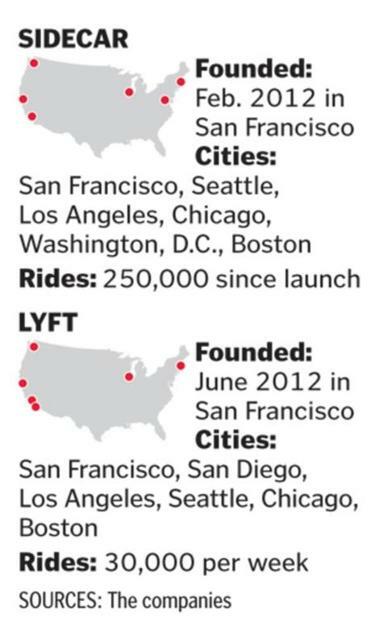 Lyft and Sidecar are only a year old, and yet each has raised millions of dollars from venture capital firms and expanded into multiple cities across the country. In Boston, the two services each have more than 100 drivers, who get about 80 percent of the fare, with the rest going to the service. Like everything else, the payment model is unusual. Lyft and Sidecar both suggest that passengers make a “donation” that is based on distance and time, but passengers can pay more or less than the suggested amounts. Perry paid Schecker $11 for his lift from his South End office to his North End apartment, a trip that costs about $18 in a taxi. Ride-sharing also seems to draw certain types of drivers — creative types looking for extra cash, or people between jobs. Schecker is preparing to move to Boulder, Colo., and launch her own start-up, and uses her driving gig with Lyft to network with other entrepreneurs. She drives at least 10 hours a week and earns enough to cover her $250 car payment, gas, and insurance. Others are the kind who thrive at juggling several jobs and feed off of the social aspect of driving other people around for money. Jacquelyn Pourroy earns as much as $250 on a busy week driving for Sidecar — “fun money,” she calls it — that she’ll use to finish a colorful Japanese tattoo that extends down her arm. “My friends all think I’m crazy,” said Pourroy, who is studying to be a physical therapist and works at a veterinary hospital. Sidecar is just her latest adventure. “When I found out about it, I thought, ‘Oh, that’s kind of cool,’ ” she said. On a recent Friday night, her fare was 25-year-old Allison Romanillos, a management consultant on her way to a Back Bay bar, who — after chatting during the ride — invited Pourroy to join her and friends later for drinks. Though she turned down the offer, Pourroy feels as if she has made a friend with each fare. Nor is she worried that as a young woman alone in her Nissan Juke she may be at risk from a troublesome passenger. Jacquelyn Pourroy (below) earns as much as $250 on a busy week driving for Sidecar. Lyft and Sidecar are among the many businesses roiling the taxi industry, whose business model was etched in stone until the smartphone came along. Livery services such as Uber, which uses professional drivers, operate like a shadow taxi fleet, while at the other end of the spectrum, private rental operations such as RelayRides let owners loan out their cars when they’re not using them. These businesses do not have anywhere near the scrutiny the taxi business receives. Lyft and Sidecar subject their drivers to criminal background checks and require that they have clean driving records and a car in good condition. The companies also provide $1 million in liability insurance to cover drivers and passengers in case of an accident. According to a recent Boston Globe series, most cabs in Massachusetts operate with the minimum coverage of $20,000. But unlike cabbies, Schecker and other private drivers do not have commercial licenses, which would put applicants through more rigorous testing, nor are their cars regularly inspected by city officials, as cabs are. Ford said that companies such as Lyft and Sidecar should be subject to the same rules and regulations as taxi companies. Indeed, regulators in some cities and states have sought to block car-sharing drivers and services because they are operating outside of the rules that have defined the for-hire transportation industry for decades. Not so in Boston. The city does not have specific regulations for the growing sector and has remained on the sidelines while the taxi industry has sought to block Uber with lawsuits. After being silent on the controversy for months, Mayor Thomas M. Menino’s administration said it will include a review of ride-sharing services in the ongoing investigation it has of the city’s oversight of taxis, following the Globe series. Meanwhile, the administration of Governor Deval Patrick has been supportive of Uber, overturning a ruling by state regulators last year that would have banned that company from operating in Massachusetts. While regulators and public officials try to wrap their heads around these transportation upstarts, techies such as Perry, a 24-year-old entrepreneur and ride-sharing customer, say that ordering up a private car is just another ritual among digital natives.